“Our wisdom body is not like an empty house. It’s filled with so many beautiful qualities. From our wisdom body, indestructible wisdom speech arises vividly and clearly, knocking down all our habitual patterns and dualities, crumbling the dense ice of obscurations that we’ve carried from beginningless time until now. Today we’re melting that ice, knocking down all our fixed conceptions with our vajra speech and sound. The nature of our speech is the same nature of our body and wisdom mind—it’s the sound of emptiness, compassion, loving-kindness, and wisdom. How are we going to learn vajra sound, and experience all the sound systems in the world as vajra sound? We’re going to start with ourselves. We’re not starting from outside; we start within. That’s the beauty of the Vajrayana teachings. In visualization practice, this is known as reciting mantras and prayers. Mantra recitation is the heat of love, compassion, and wisdom that melts the ice of duality. It’s the light that clears away the darkness of ignorance. This indestructible sound is great emptiness. We can see this immediately. The moment right after sound arises, it dissolves and then reappears. It’s an ongoing, spiraling wheel carrying a tremendous magnitude of power, blessings, and abilities through every galaxy. But it doesn’t just start in some local area in our body. Of course it might appear very localized, but actually it’s a vibrating, ripple effect moving through all physical systems— our channels, winds, and the entire space of our inner body, as well as through the entire universe. All of this begins from the primordial wisdom nature of our mind, the self-born Guru Padmasambhava. The whole universe of sound is transformed into a beautiful vajra sound system. Mantra is not an isolated thing happening once in a while. It’s the ongoing sound system of the mandala. We’re discovering the infinite, continuous, unceasing sound system of the vajra. Photo of Ven. 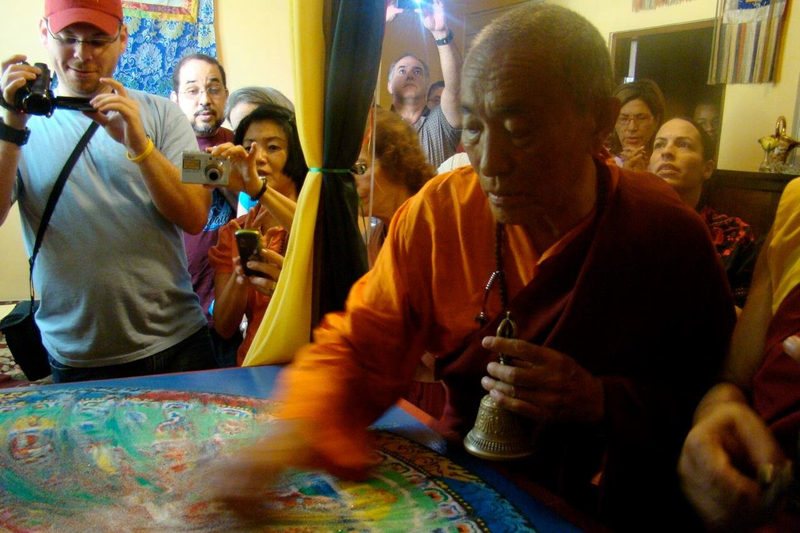 Khenchen Palden Sherab Rinpoche dissolving a sand mandala in PBC Puerto Rico around 2006.